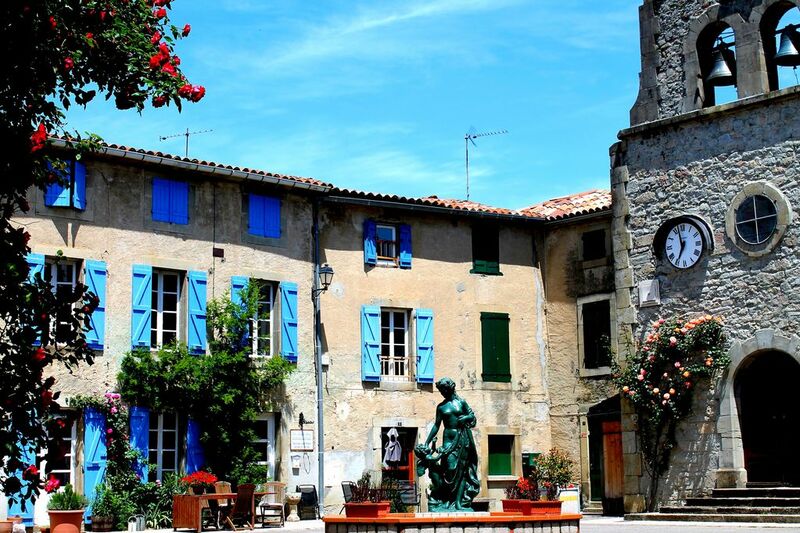 3 bedroom holiday cottage on a pretty little village square south of Carcassonne. Best for: couples, the cottage is cosy and intimate, smaller groups and families, relaxation and exploring, roads less travelled. The cottage has been carefully converted from the old piggery and has been transformed into a stylish, French country home, "the mix of old and new is delightful." We can accommodate up to 4 adults and 2 children in three stylishly appointed bedrooms over 3 floors. The ground floor double room with WC leads onto a secret courtyard garden with beautiful wrought iron table and chairs for 2. A further double room is at the top of the house and across the tiny landing, a room with 2 single beds perfect for children. There is room for a cot in either of these rooms. The well equipped kitchen with washing machine and open plan dining room are on the ground floor, hand crafted oak stairs lead to the salon with comfy leather sofa, books, games and DVDs. The private roof terrace is off the salon with lovely views across the fields and hills. The spacious family bathroom with beautiful roll top bath and shower over is on this floor. Enjoy dinner on the candlelit terrace to the sound of cowbells, or on the square in the shadow of the lovely old church - and know this is why you came to this beautiful, unspoilt corner of southern France. Prices are fully inclusive of all taxes, utilities, linens and towels. All bookings include store cupboard essentials, bath products and a very nice bottle of local wine. Plenty of free off street parking in the village close to the house. Walk or cycle from the door through fields, forests, hills and vineyards. It's a great base for cycling holidays, bikes may be hired locally from 15 euros per day, delivered to your door. The wild swimming is a treat, there are 2 beautiful swimming lakes, Montbel and Puivert within a few minutes, there are rugs and a picnic basket in the cottage that you are welcome to use. Mirepoix, at 14kms has the best farmer's market in the region and is a must see. Carcassonne is about an hour, spend a day wandering its medieval cobbled streets or combine with a trip to Carcassonne Plage, the sandy beaches and clear waters offer a great alternative to the coast. The prehistoric caves paintings in Niaux, are very special, about an hour away, they are now the only remaining caves in Europe where you can view original paintings rather than replicas. Kids can learn to make fire and use a bow and arrow at the Prehistoric Park in Tarascon, big kids love it too! Learn about the history of the Cathars and explore their poignant, ruined castles on rocky outcrops, Montsegur, Foix and Perypertuse are all closeby. Carcassonne airport is less than an hour (Ryanair) Toulouse is an hour 15 mins. Perpignan, Montpellier, Beziers & Barcelona are all reachable. Drive from the ferry ports within a day or get the train as far as Pamiers. The region usually enjoys exceptionally good summers, hot and dry though storms can come and go quickly from the mountains. In Spring, the fields behind the house are filled with wild flowers, tables and chairs begin to appear on the pavements, and the first bounty of the hedgerows appears. Autumn is often mild and sunny, a lovely season to explore the region, avoiding the summer crowds. Winter offers skiing in the beautiful, nearby Mont d'Olmes and Ax Les Thermes, the largest ski resort in the Pyrenees. Super value at only a few euros for a lift pass. The Aude is a fabulous region for birdwatching with a wide range of habitats, home to around 200 nesting species. From our terrace buzzards are a common sight, soaring high on the warm thermals. Watch the delightful “bobbing” habit of the black red starts and as dusk falls, see the barn owl heading off on its nightly patrol. In summer watch the amazing spectacle of swifts racing round the square hurling themselves into the eaves, often colliding with the zinc guttering with a resounding clunk whilst the house martins look on bemused. We love our house in the foothills of the Pyrenees in this beautiful, unspoilt region of the Languedoc, even though it is almost the polar opposite of what we set out to find. It’s not small, it’s not manageable, it was partly derelict (still is) all the things we said we would avoid during the planning stages, many of which took place in Wetherspoons in Workington, my home town. Mmmm, maybe that was it. Nick had put in an offer for another house on a recent visit that he had made alone, and so confident was everyone that it would be what I wanted, the vendor had set off from Holland to sign the necessary paperwork. So despite the consternations of the agent having made assumptions about what I would and wouldn’t like despite never having met me (not sure what Nick’s excuse was) we continued our search. Which led us to the house in Sonnac Sur L’Hers, really 2 houses that the previous occupants had begun to knock together, i.e. bash 2 holes in the wall between the ground and first floors. The main house had 6 bedrooms, all in various states of repair, and with potential for at least 4 more in the attics, a brown bathroom suite in a bathroom “big enough to hold a tea dance” according to the agent, and a huge sunny terrace with views across the churchyard, fields and hills. Oh, but what a lovely feel there was. The huge blue shuttered house standing on the ancient village square with its church and beautifully restored stone walls of the Marie - our taxes obviously stretch to proper, authentic, lime render. The church bells chime right outside the bedroom window that Matthew and George shared on one of their many snowboarding trips to the Pyrenees. So no sleeping past 8am although thankfully they don’t ring through the night. We have stayed in some of the most remote, picturesque villages in the south of France and returned home shattered, each night’s sleep ruined by the incessant tolling of church bells. The purchase was fairly smooth and the house was ours within 3 months, although where the log burning stove was that would keep us warm during the cold winter nights of the Aude, was a black hole. There was a cat in the secret garden, which didn’t concern me at all, and a bat in the corner of the mezzanine room which concerned me a great deal. (We left the door open taking a chance that it would fly out rather than all its mates fly in). Our first few days in the house were spent in a daze, wondering what on earth had possessed us. The house we discovered had been 3 houses in the more pragmatic days of the 1700s. There was evidence of 3 front doors and 2 staircases remain, lovely winding oak stairs from the main sitting room all the way into the attic (derelict) and a spiral staircase tucked away in the back of the kitchen. The third probably crumbled away sometime in the 19th century. So, completely overwhelmed, we spent the week drinking wine then set off to catch our flight home. It's a beautiful region in southern France, fields stuffed with sunflowers, grapes ripening on the vine, the sun mellowing the ancient stone of ruined chateaux that stand on rocky outcrops, testament to past conflicts of Languedoc. We had an early start from Sonnac sur l'Hers following the old railway line through Camon, a plus beaux village de France, onto Mirepoix and Fanjeaux, all key strategic towns during medieval times and the crusade against the Cathars. Quiet roads, twisty cols (if you want them in this heat) and wide valley floors that sweep through vineyards and ancient towns and villages, make cycling Languedoc joyous. I was grateful for the old French law decreeing its people should always have free access to drinking water as I replenished my water bottle (and dunked my face and arms) in the centuries old lavage (communal washing facilities in a bygone age) in a tiny village by the roadside. The river runs through the village and is about 10 mins walk from the house. The kids can fish with the fishing net provided, great fun - for big kids too! We had a lovely holiday in this area which is a little bit off the beaten track in southern France. The cottage is beautifully done, it's pretty old yet the modern fittings make it very comfortable while still retaining all the gorgeous old French character. The square is a lovely place to sit, we spent a lot of time just relaxing, reading and drinking wine, it was so nice being around the house we really had to force ourselves to do anything. We managed to hire bikes for a few days, it's a great way to explore the countryside and the neighbouring towns and villages. You can avoid the roads by using the old railway lines that crisscross the region. Mirepoix market is highly recommended and the choice of restaurants there is superb around the medieval centre. We loved everything about our holiday here. We stayed here for a week at the end of September and had a truly wonderful time. The house sits on the pretty little village square and has been beautifully transformed from the piggery it once was into a comfortable, stylish home from home. We enjoyed everything about our stay, the warm welcome, the complimentary wine and home made jam, delicious dinners at the B&B next door - even though we were self catering it's nice not to cook every night on holiday. We walked and cycled from the door, you can step out into wild flower meadows, forests and hills; we biked around the lake - mountain bikes are required, they can be hired locally at very reasonable rates, and one of the many highlights was a trip to the prehistoric cave paintings at Niaux, about an hour away, the only place left in Europe according to our guide, where you can look at the original paintings rather than replicas. A day out in the ancient walled city of Carcassonne is also a must, after a bit of boutique shopping, we enjoyed a long, lazy lunch in a lovely cobbled square. I would not hesitate to recommend Chez Maison Bleue to anyone looking to experience the "real" France who enjoys the countryside, culture, history, and something just a bit different. We have already booked to go again. I knew I wanted to return to this area in southern France and couldn't have picked a better "home away from home". I rented the Gite for 3 weeks and ended up staying a month. Cozy and comfortable with a nice blend of antiques and Ikea and my own personal fig tree! The bathtub was divine with a few of the village square. The pictures are very accurate on the website. I loved the ambience and charm of the small village, with the tinkle of cow bells and you are within a short distance of castles and wineries by car and bike. Just watch those French drivers on country roads! The open market on Mondays in Mirepoix is the best way to shop and only 20 minutes away. Carolyn and Nick were the kindest and very respectful hosts, very responsive by email and always willing to help me bumble through a French translation or share a glass of wine on the terrace! Just a totally joyous experience and I shall return! You won't be disappointed by your visit. Tammie, thank you for your kind words, we are glad you were able to spend 4 weeks exploring Cathar country and the medieval towns & villages that surround Chez Maison Bleue. And very glad your journey from Canada was an easy one because of our close proximity to Toulouse airport. Until the next time! The first week of our holiday we spend at the gite off Chez maison bleue, what a surpise ! The warm welcome of Carolyn and Nick at our arrival and the beautifully restored medieval stable wich is transformed into a modern gite next to the BB. The gite is really clean, nice and complete, situated at the small village square. Nicks lovely meals we enjoyed at the terras of Chez Maison Bleue. Even our vegetarian daughter was served lovely meals by Nick. It is a fact we will return to enjoy Chez Maison Bleue again! Thank you Martin and everyone. We hope to see you again soon, perhaps for some skiing in the Pyrenees in the New Year. Hope you have recovered from your "Crazy Rafting"! Somos un grupo de 5 amigos que decidimos pasar una semana de vacaciones en La Maison Bleue. Es un estupendo punto de referencia para recorrer la zona de Languedoc. La casa llegó a ser parte importante de las vacaciones. Desde luego, no tuvimos más que gratas sorpresas. Sin trampas. Todo funcionaba, todo estaba limpio y en perfecto orden. Decoración cuidada y con agradables detalles. Y qué decir de nuestros anfitriones? : amables, preocupados por nuestro bienestar, y encima con buena y cuidada cocina. Nos sentimos cuidados como en casa. Totalmente recomendable! Y para teminar, la zona preciosa y los castillos muy empinados. 18th century holiday cottage on the village square south of Carcassonne. A few minutes drive from beautiful medieval Mirepoix. Easy access Carcassonne and Toulouse airports, Perpignan, Montpellier, Beziers & Barcelona just a bit further. Get closer to nature in unspoilt region of Languedoc; walking, cycling, mountain biking, bird watching, river and lake swimming, horse riding and fishing. We are cyclist friendly, bike hire is available locally. Explore the nearby Cathar towns of Mirepoix, Puivert, Montsegur and Fanjeaux. Our nearest town is Chalabre at 3kms for a fabulous bakery and chocolatier, bars and restaurants. There is lot more information about the house and the area on my website, Chez Maison Bleue. Other Activities: canoeing, white water rafting, wine domaines, Cathar history and legends, horse riding and karting. Ski: The French Pyrenees are a stunningly beautiful range of mountains and completely underrated for winter sports. Whilst you don’t have the range and sophistication of the Alps, neither do you have the prices or the queues. An adult daily pass at Les Monts d’Olmes (45km) is around 30 euros and for a family, 80 euros. Les Monts D’Olmes (1500-2000 metres) offers family orientated skiing in the stunning Massif de Tabe region of the Pyrenees and has 23 runs, a snowboard park and ski school. Ax Les Thermes (1400 – 2300 metres) is about an hour away and is the largest ski resort in the Pyrenees. This lively resort offers 29 runs covering 80kms and includes some beautiful forest lined slopes. Daily adult pass is around 30 euros.